Opinion: A Linguist's Defense Of 'Falsehood' Geoff Nunberg says that "falsehood" isn't just a decorous synonym for "lie." Instead, it has a moral weight of its own — especially when it comes to the effects of what someone says. But we have a vast vocabulary to describe all the ways statements can depart from reality, and it's gotten a considerable workout over the last couple of years. NPR's Policy On Referring To "Lies"
Every news cycle seems to bring a new claim from the White House or elsewhere that cries out for correction and sends editors and journalists to their thesauruses, as politics makes linguists of us all. Should they simply qualify the statement itself, and if so, should it be called false or questionable, spurious or bogus, misleading or baseless? Or should they directly challenge the speaker's sincerity, and use the charged word "lie"? The establishment media have been pondering that question at length. 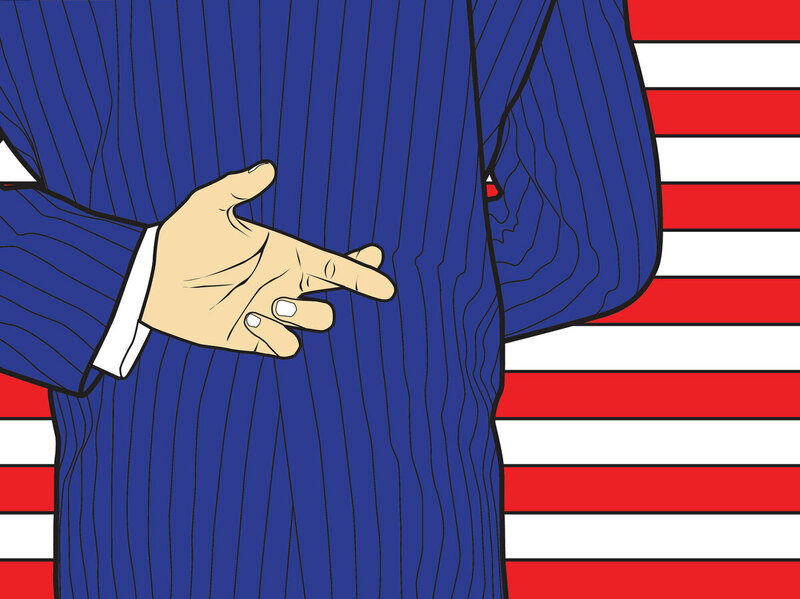 A few of them, like The New York Times, allow themselves to use "lie" more-or-less sparingly. But a great many others have consigned the word to the verba non grata file. They argue that "lie" implies an intent to deceive, and you can't objectively observe what someone believes — in fact, sometimes they don't even know themselves. And even when someone's deceptive intent is obvious, calling a statement a lie is invariably antagonistic. You can't use the word dispassionately; as the Oxford English Dictionary puts it, "lie" is a "violent expression of moral reprobation." But that's exactly why a lot of people demand that journalists call out lies wherever they see them. The New York Times' Maggie Haberman provoked a torrent of indignant tweets earlier this year when she described two of the president's statements as "demonstrable falsehoods," rather than lies. One journalist tweeted that "falsehood" should be removed from the dictionary, adding "Let's call a lie a lie." The linguist Dennis Baron says that "calling lies falsehoods is pulling your punch." "Falsehood" can have a moral weight of its own, especially when we're more concerned about the effects of what someone says than whether they were being insincere about it. But not so fast. It's true that "falsehood" can sometimes be just a decorous synonym for "lie." But often it's just the word we want. It's an old-fashioned word with the fusty ring of the pulpit, and we rarely use it in everyday speech. But "falsehood" can have a moral weight of its own, especially when we're more concerned about the effects of what someone says than whether they were being insincere about it. The birther story is a quintessential falsehood — a narrative feeding on malice and ignorance, which took on an independent life as it passed from one person to the next. In that sense of the word, a falsehood does its work whether the person spreading it believes it or not. Modern communication technologies have created powerful resources for publicizing and circulating falsehoods. They permeate social media, where we call them by other names — they're "misinformation," "propaganda" or "fake news." Those words don't apply to individual statements, but to concerted efforts to shape public opinion. They're relatively recent words — they only date from the rise of the mass media, and their meanings have been disputed ever since. Even so, the engineers at Facebook find themselves in the unenviable position of trying to reduce them to rules, so that they can hand them to their moderators to police what they rather wistfully describe as the "Facebook community." Facebook says that they'll take down content that's doing harm or attacking individuals. But they won't block something just because it's false. Their argument recalls the one that journalists give for their reluctance to call some statement a "lie": How can you tell whether people believe what they're saying or not? In a recent interview with Recode's Kara Swisher, Mark Zuckerberg explained why they wouldn't remove the pages of Holocaust deniers. "It's hard to impugn intent and to understand the intent," he said. "There are things that different people get wrong. I don't think that they're intentionally getting it wrong." He said that Facebook might demote the post in the newsfeed, but they won't just remove it. A lot of people found those remarks distressing. Shortly after the interview, the Anne Frank Center announced that they had gathered 150,000 signatures on a petition calling on Facebook to remove Holocaust denial pages. The fact is that saying the Holocaust didn't happen isn't simply getting your facts wrong, like confusing Benicio Del Toro with Antonio Banderas or saying that carrots help you see in the dark. Whoever utters it is spreading a malignant falsehood, whether they're devious people or merely deluded ones. As the tech entrepreneur and social activist Mitch Kapor said, "The intent of Holocaust deniers is not the sole standard of judgment. It's the impact that matters." In the current climate, it's easy to get fixated on mendacity in high places. But bear in mind that the word "truth" has two antonyms. Sometimes we contrast truth with lies and sometimes truth with falsehoods. We need both words. Even transparent or trivial lies erode our trust in one another. And when lies are more consequential, they can be amplified into pervasive falsehoods, which distort the way that people see the world.